First the Man Cave now the Bar Shed. 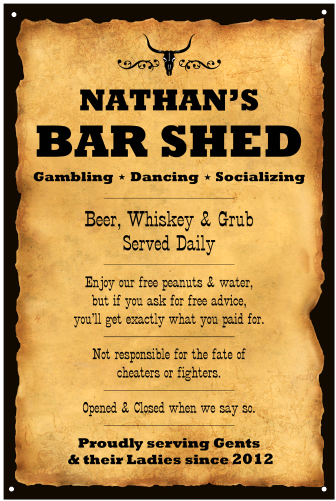 The owner of this Personalized Bar Shed Western Vintage Metal Sign will appreciate the humor on this sign. Bar sheds are the latest trend in backyards, especially for those who either don't have room for a Man Cave or for those who enjoy hanging out in their backyard. Done in a vintage style, this Personalized Bar Shed Western Sign is durable, has a long lasting finish and is approximately 12 in. x 18 in. and is drilled and riveted for easy hanging. This quality sign is finished with a vintaging process done by hand to give this sign an aged look and feel. Proudly hand made in the USA, this sign is approximately 2lbs and is made of heavy 24-gauge American steel. Therefore, this is NOT a tin sign. A Man Cave Gifts Exclusive!